Most people know coax has loss, the higher the frequency the greater the relative loss. You can go buy better coax with less loss – however every coax has loss and once the signal is lost, it’s lost. This is more prevalent on receive as in reality loss in the receive system equates to noise, and loss before a preamp is added as noise in the preamp gain along with the wanted signal, not what you want. On transmit you can over come coax loss by increasing the transmit power at the radio end of the coax. The way to get round the receive issue is to put a preamp as near the antenna feed point as possible so there is as little loss, thus noise, added to the wanted signal***. 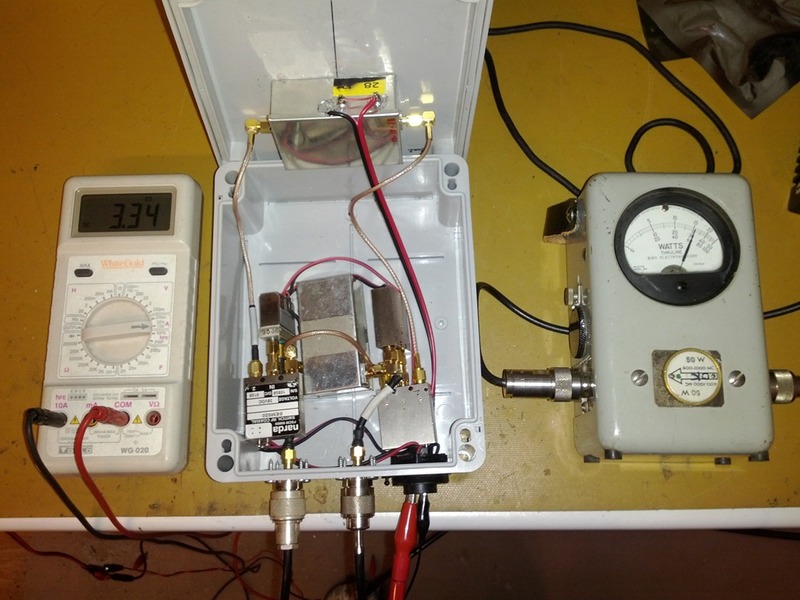 In reality with a preamp at the antenna feed point the gain of this amplifier only needs to equal that of the coax losses, so if you have coax losses of 10dB then you don’t need 30dB of gain! 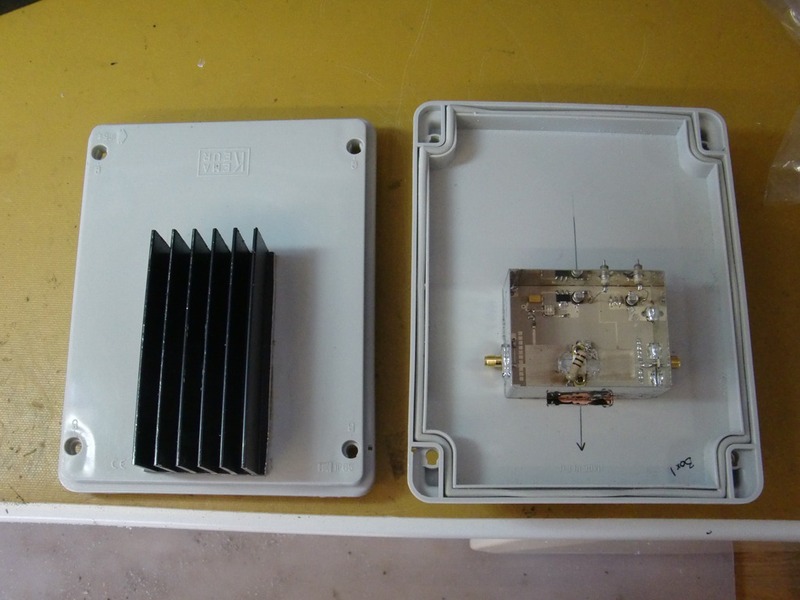 *** Why are there no Yagi manufacturers which offer a model with a preamp integrated into the feedpoint? When G3PYE/P started being active in the UKAC contests, 23cm was always our weak point. We did what we could to minimise our losses between the radio and antenna. 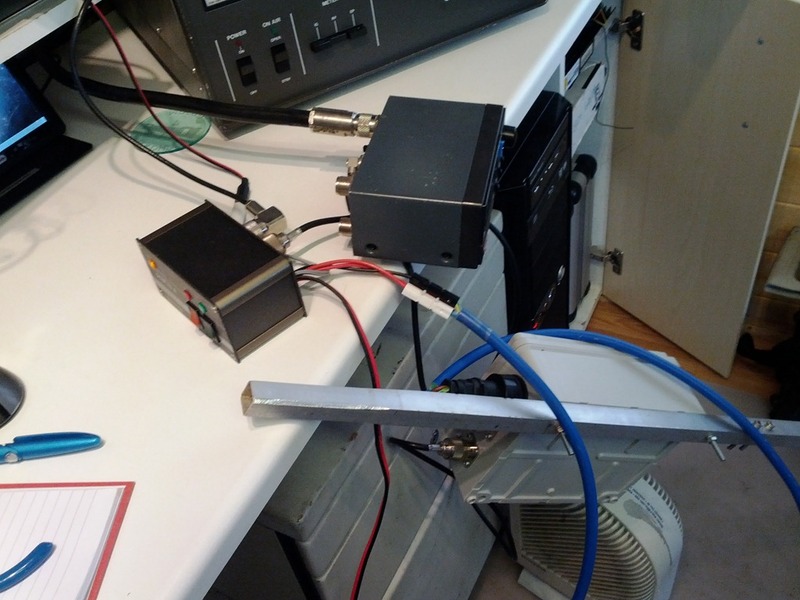 The target was both reducing the loss of received signals as well as increasing the transmit power to our antenna so we were heard by other stations. When I built the masthead box, the G3PYE/P station used 25m of Ecoflex-15 coax to reach the antenna atop the 20m pneumatic mast, but on 23cm we found even this length of “decent coax” had a big restriction on our signal and we could only usually manage a couple of dozen QSOs at best. Although the Ecoflex-15 datasheet states, for 25m of Ecoflex-15 coax, the loss should be 2.45dB (100m = 9.8dB), in reality we found our 25m run to be nearer 6dB ! 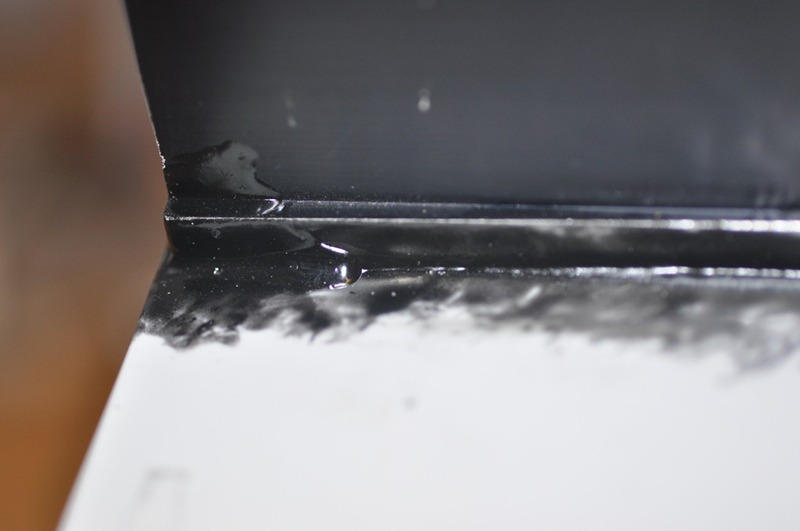 We found this on 2 different lengths of Ecoflex-15 we have, each from different drums… So for 23cm we cut one of our runs to be 10m, which reduced our losses to 2.4dB but meant we could only pump the mast up to 8m AGL. While this improved our losses it impacted our coverage due to the antenna being less high above ground. I should mention at this time we used a homebrew 47element yagi, we made 4 of them for the 2009 VHF NFD. 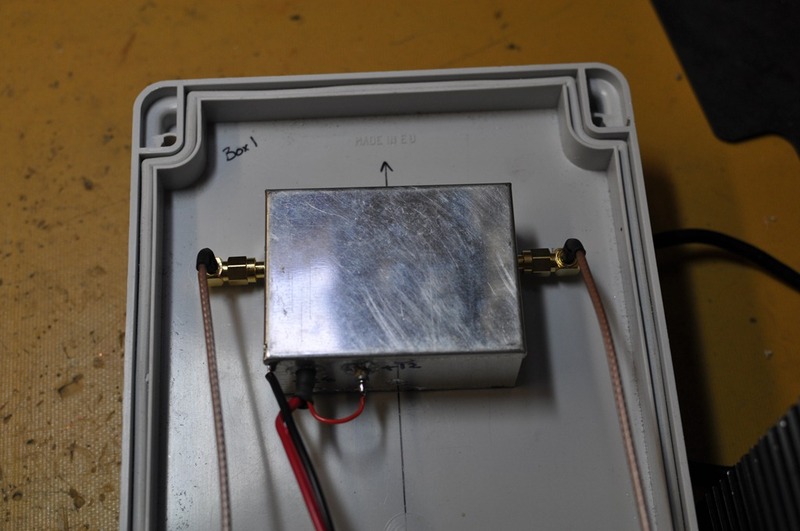 As part of the improvements to the G3PYE/P station contest group, I originally built a masthead mounted preamp to overcome all coax losses on receive, this is nothing special, however what I also done was to build it in a box which also housed a 45w transmit amplifier, not so common. 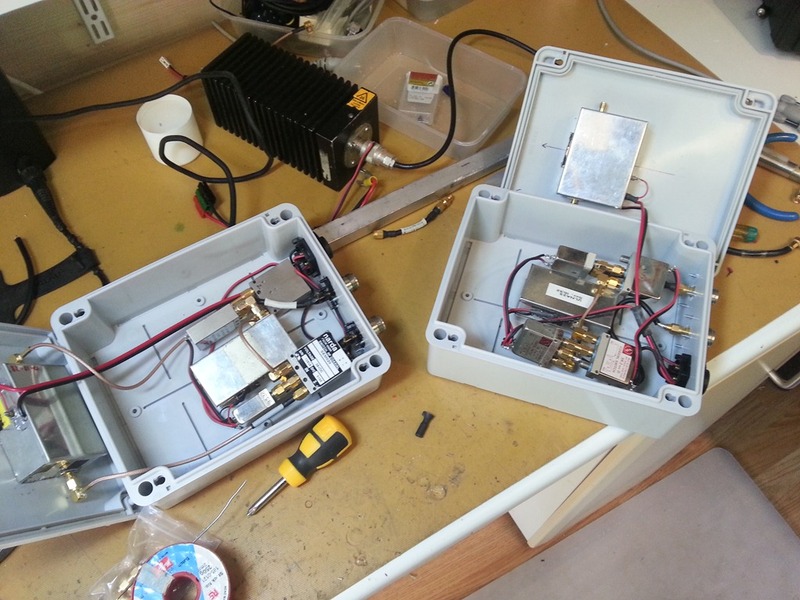 Actually I built 2 identical units, one for G3PYE/P and one for G6UW. 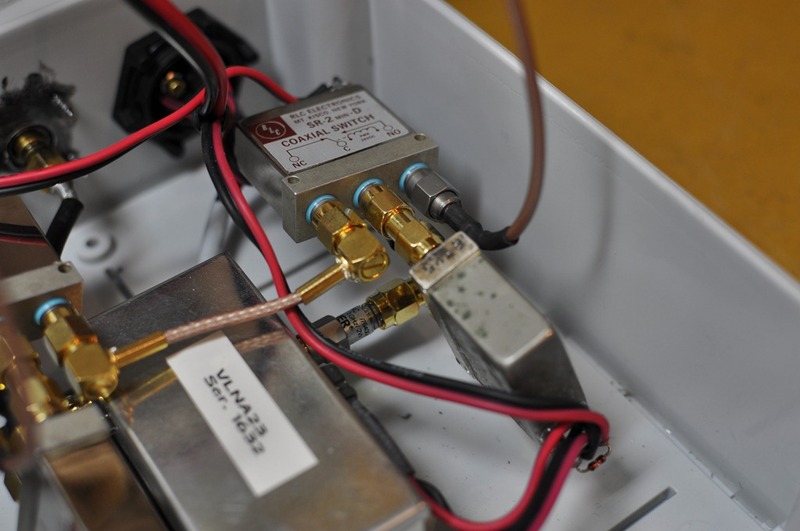 The preamp was an LNA one supplied by Sam G4DDK and the transmit amplifier was one of John G4BAO’s. If we looked at our average positions in the RSGB 23cm UKAC contests then before we started using the 23cm masthead system we had an average position of 4.4th place (5 events) in restricted section. After starting to use the masthead system from June 2012 our average positioning became 2nd over 6 events (1.3 if you remove one short entry), a huge improvement in my opinion. Here is the block diagram of the system. As you can see there are 2 parts to this, the Masthead Box and the Control Box. The Masthead Box is, quite obviously, mounted up top next to the antenna. 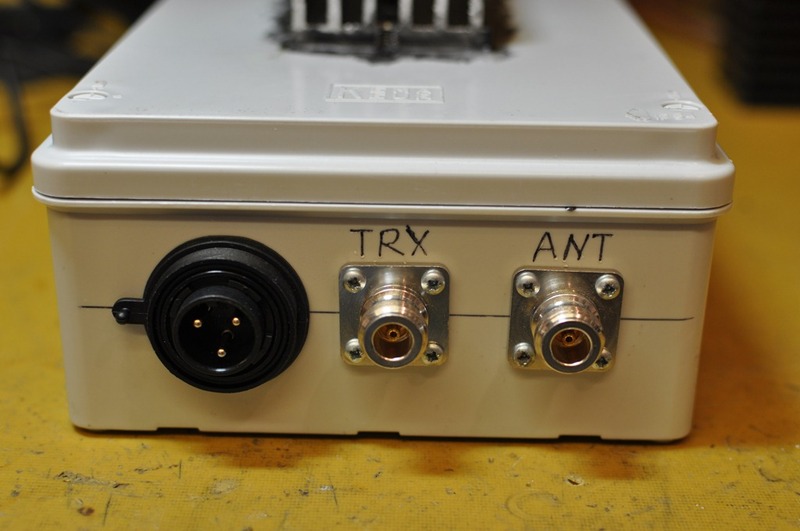 The control box sits with the radio and between them is 3 core mains cable, as thick as you can get so there is as little voltage drop as possible, and the coax carrying the RX and TX RF. The main function of the control box is to switch power to the RX and TX amps ensuring only one has power at any time! Especially the RX amp. Notice in the control box that the 24v input can only goto either the RX amp or TX amp via RL1, but even though RL1 switches power On or Off there is still a possibility that while the RX amp is On the radio can transmit, without the TX amp, which will still be enough RF power to damage the RX amp, so as another layer of protection is needed. 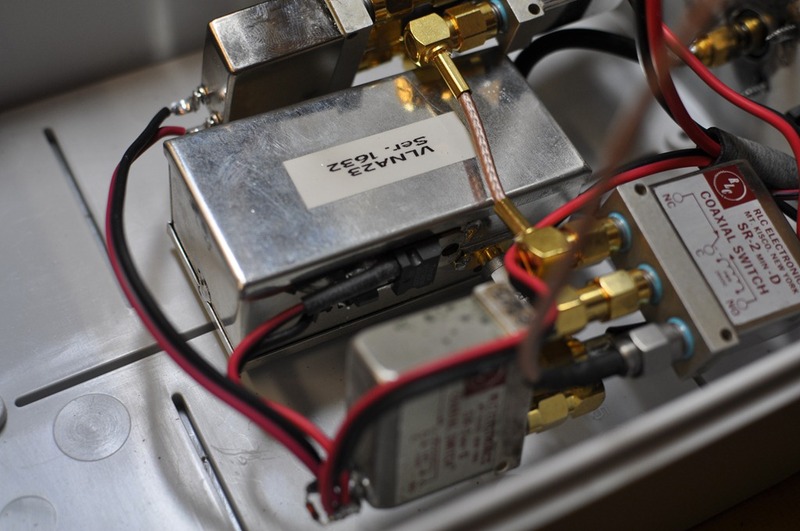 To power on the RX amp the control box needs to have DC on the coax radio input, this then feeds into the relay RL1 via an inductor L1 and blocking it from the masthead box/antenna with C1,a bias-T. 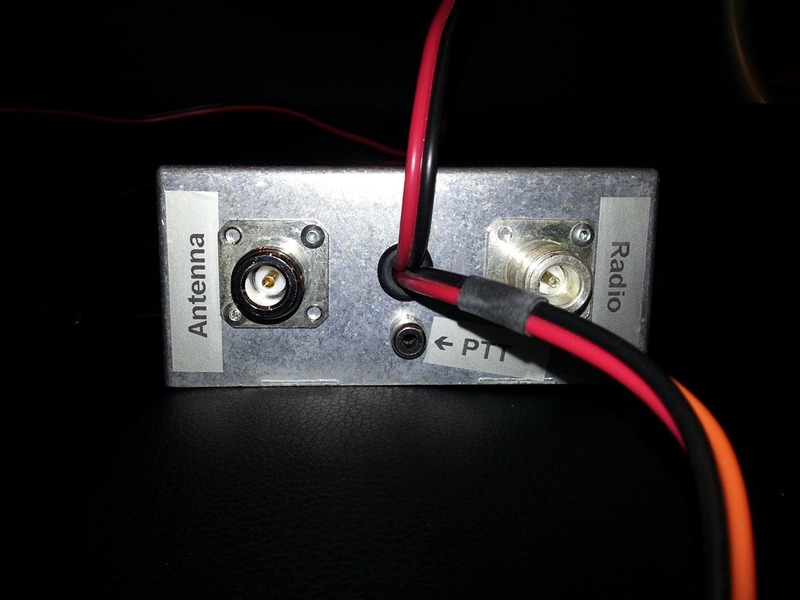 When RL1 is engaged RX_EN is on supplying power to the RX amp in the masthead box. 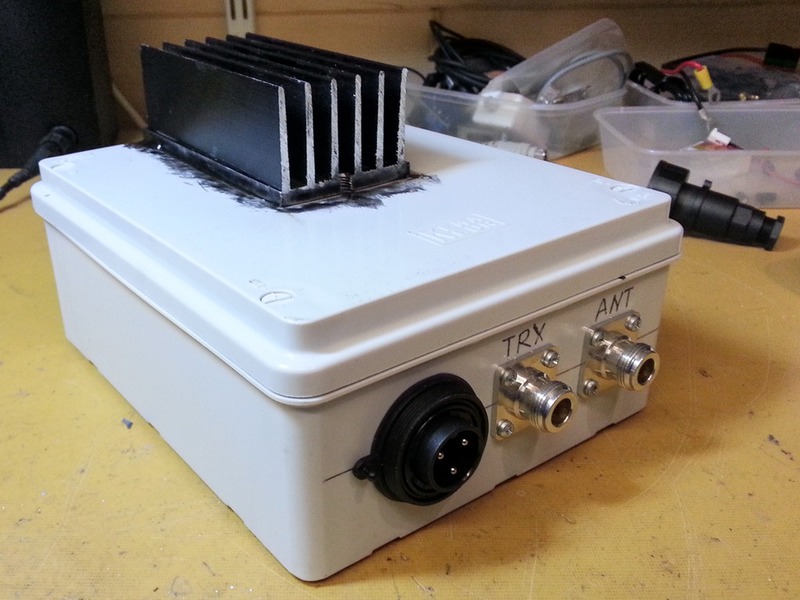 The IC-910, or external bias-T can be used to supply 12v on the coax into the control box. 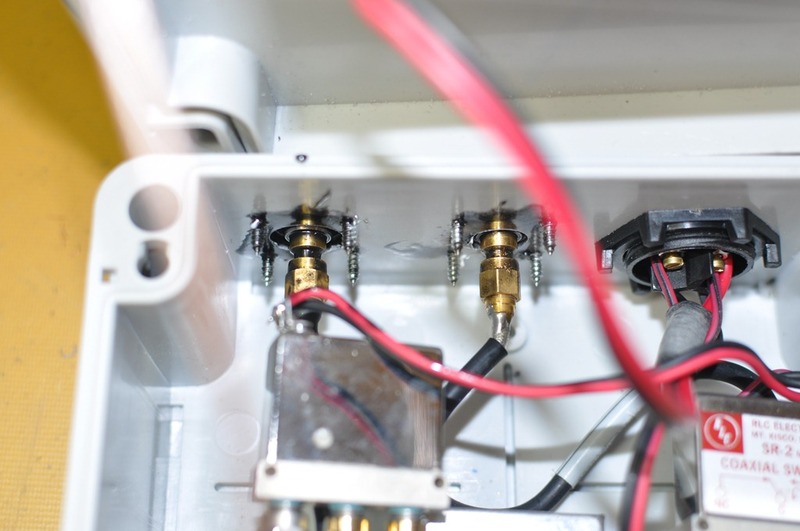 Requiring 12v on the coax means the radio RX/TX switching controls the RX amp power eliminating the problem of there being power to the RX amp while the radio is in transmit. TX control is done by hard-switching a relay connected to the radios PTT control line. This is the TX_EN line which connects to the radio PTT line which enables the relay and therefore 24v on the control line when TX_EN is grounded. Again the IC-910 will always remove this 12v from the coax before going into TX which meaning the the control box can only have RX_EN or TX_EN enabled at any one time. 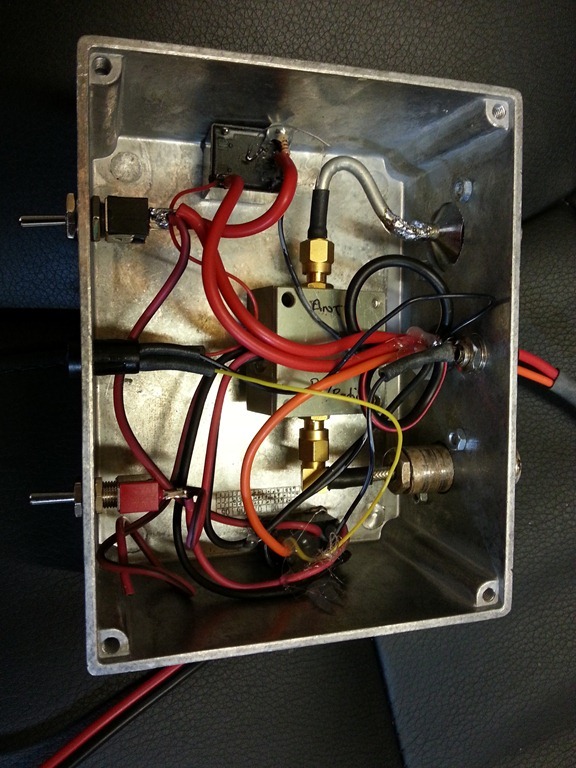 The masthead box houses the TX amp, the RX amp and RF relays to switch each in or out. 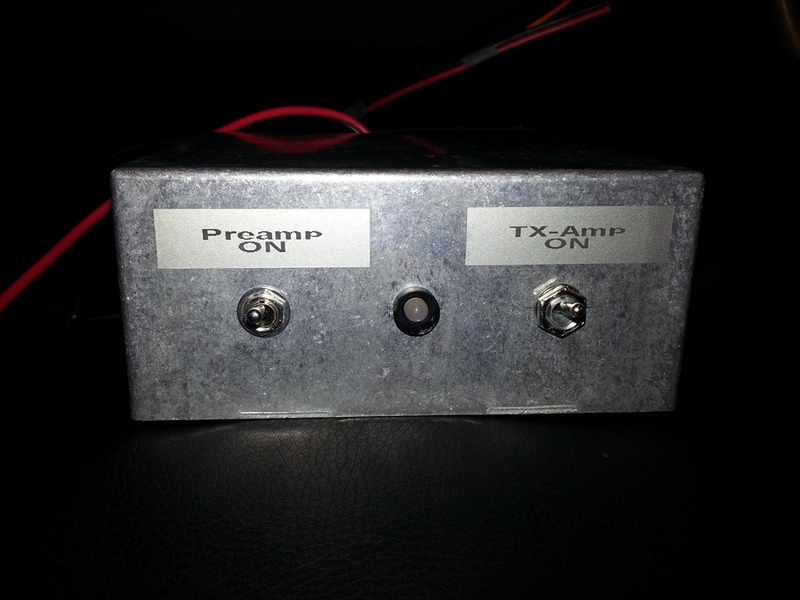 The TX amp is designed by John G4BAO and provides 45w output for 2.5w in and is based on an MRF9045 28v 45w device. This drive level is ideal as the Icom IC-910 has 10w output on 23cm and by the time it gets to the top of the Ecoflex-15, with its 6dB loss, there is the 2.5w needed, perfect. Here you can see the TX amplifier on the top cover with the preamp in the middle below and the relays either side of it. You can also see with 30w out here (2.0w in) for 3.34A @ 26v, 86.84 DC watts, which shows 34.4% efficiency, the datasheet claims 41% so quite close showing the design is good. When the amp is at 2.5w in the efficiency rises to 37.6%. The preamp has 38dB gain with 0.28dB NF which is amazing really. Possibly too much for terrestrial applications, and I did plan to put a 10dB attenuator on the preamp output to stop overloading the Icom IC-910 receiver, not done that yet but in the UKAC’s we don’t see an issue. The connector for the DC is a Bulgin Buccaneer 3 pin waterproof plug which is good to 10A. 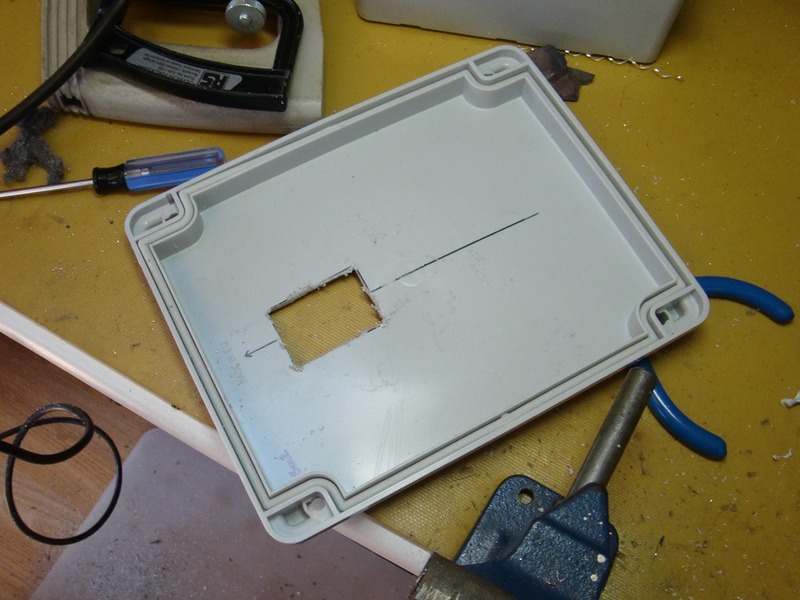 To mount the TX amplifier, the heatsink was glued to the outside of the box and a hole cut where the PA would attach to it. The PA board is screwed to the heatsink so in effect sandwiches the box lid between the heatsink and the PA box so it won’t move out of place. 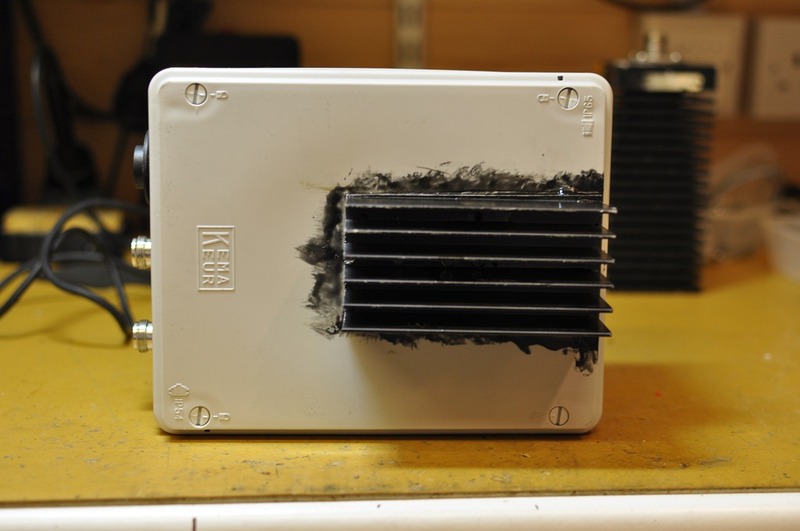 To waterproof the heatsink in order to stop water getting through the hole we have made in the lid, I used liquid tape on the outside edge of the heatsink. So I not only made one of these units for G3PYE, I also made one for G6UW, the Cambridge University club, they are effectively clones of each other, only the control box housing differs. Nice article Gavin, gave me inspiration to get my figure out and put together all the parts I have to create the same setup. Interesting comment re ecoflex. I too have a duff length, 8 metres measures 6 dB loss at 1296Mhz.Poor quality. The word “can” should be “cannot”! Thanks for the comment Eddie. 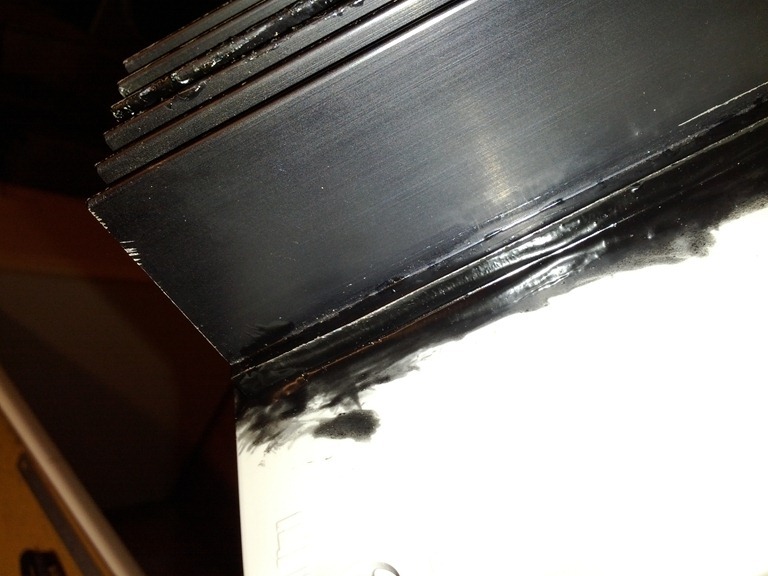 My conclusion is Ecoflex 15 is really not up to constant manipulation (winding, unwinding). Also thanks for pointing out the mistake in the article, that’s now corrected.